Single party communism was abandoned almost 25 years ago, but people in Serbia are still madly in love with the biggest workers day off – May 1st, or May Day. It’s a nation-wide holiday, and everybody takes to the great (or not so much) outdoors to barbecue and seriously relax. This year, Sokobanja, one of the leading spas in the country is making a wide ranging picnic festivity. Sokobanja is located in central part of eastern Serbia, some 230 km from Belgrade, and 90 km from Nis. The event is called ‘’Prvomajski uranak’’, or loosely translated ‘’Mayday Morning’’, and it’s going to take place on several meadows and picnic sites, ideal for BBQ. For everyone that doesn't feel like cooking, a mini fair will be dedicated to local cuisine. A part from this, galleries will be presenting an ethnic themed series, and in the center of the city, forth annual flower festival will be held. This event sound like fun for families or bigger visitors groups. I like the ethnic touch, because usually, Mayday is all about eating meat, drinking beer and doing nothing else. This is a good sign of diversifying a big national holiday. Apartmani “Bogdanovic” se nalaze u najlepsem delu Sokobanje, tzv. ulici ‘Breza’. Ovaj kraj je poznat po svojoj lepoti i prirodnom i tihom ambijentu, što će vaš boravak kod nas učiniti veoma ugodnim i opustajucim. Cetvorokrevetni apartman se nalazi na drugom spratu porodicne kuce u najlepsem delu Sokobanje. Kao jednu od prednosti navodimo i blizinu izletista “Borici”(lep predeo pod borovom sumom i stazama za setnju), kao i park “Cuka II”. Oba izletista su na 5 minuta pesaka od nas. Apartman je kompletno opremljen (kablovska TV, TA pec + kamin, posudje, posteljina), a takodje je obezbedjen i parking prostor. Po dogovoru se mogu iznajmiti samo sobe sa kupatilom bez dnevnog boravka. 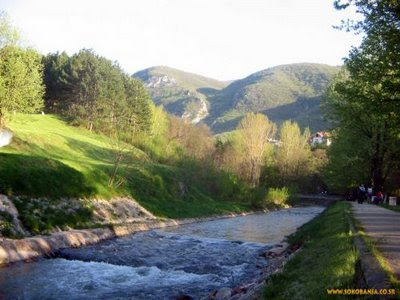 Sokobanja is situated in the southeast of Serbia, between mountains Ozren (117 m) and Rtanj (1560 m), at the riverbanks of Moravica, at the height of 400 m above the sea level. Taking a highway. Sokobanja is 230 km away from Belgrade. It is one of the most visited places in the country, and belongs to a group of renowned tourist centers with the longest tradition of organized tourism.